DynaRange Has a New Home! It seems that DynaRange has outgrown it’s humble home here. To purchase the learn more about DynaRange, or to purchase a copy, visit the new home at FWTrader.com. 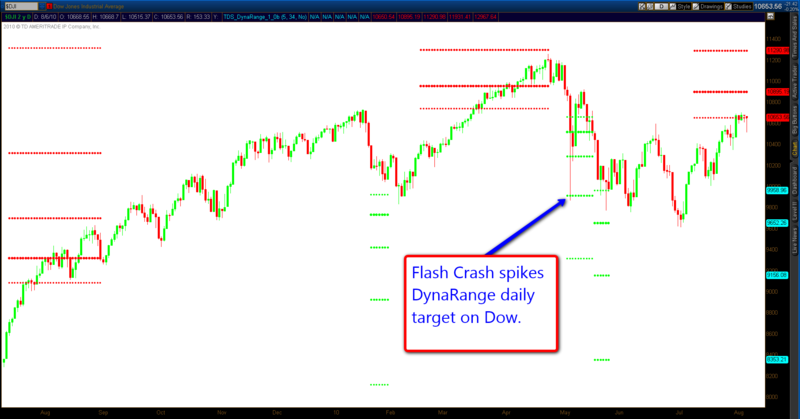 Did you have a target for the flash crash? Were you watching the markets move intraday during the Flash Crash? Were you short? I hope so. I was, and by sheer luck I covered within 50 Dow points of the bottom. Even though I had already written the DynaRange study, I had just started testing it and I wasn’t watching it intraday. If I had been, it would have told me where to exit the short trade. 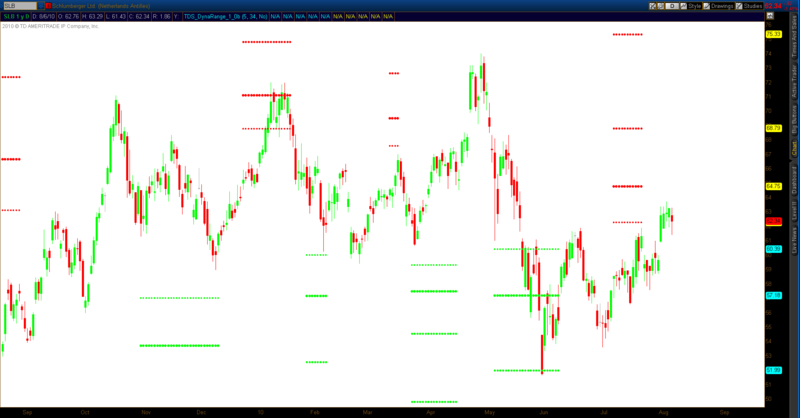 The daily chart of the Dow shows how the crash reversed from just below a DynaRange support level. We often hear repeated the advice that planning good exits is far more important than entries for successful trading. DynaRange helps traders determine where a trend is likely to end and, therefore, where good exits might be. The First Wave trader has many excellent techniques for identifying good entry points. Once the trend has established itself, DynaRange looks for clues to predict how far it can travel and places them on your chart. Several months ago, David Elliott introduced me to the technique for predicting how far a move would go. Those who follow his regular chats may have seen him use a long-term stochastics line crossing 50 as a signal that price has traveled roughly half of the move. While based on David’s insightful observation, DynaRange is the result of extensive research and tuning that has honed the basic concept into a reliable trading tool. DynaRange works on just about every instrument and just about every timeframe. Just look at some examples below. Some of you know Kevy99 from chat. He likes to watch DynaRange for short-term scalps using a 55 share chart which is great after-hours. This chart of e-Mini Dow futures from around the time of the August 6, 2010 jobs report shows how DynaRange can be used even in news driven markets. It found the peak prior bad numbers and support where the move ended. The chart also shows how Fisher Stochastics works in concert with DynaRange to help indentify whether price will stop at a particular DynaRange level. DynaRange works with equities in just about any timeframe. 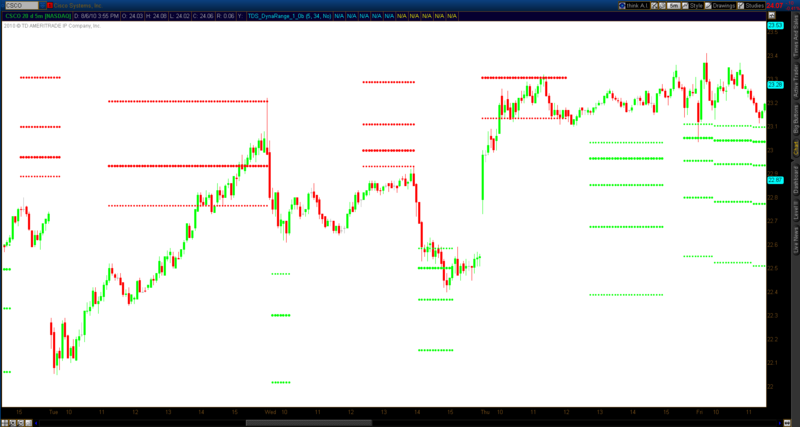 Here are examples of a five minute chart for CSCO, a daily chart for SLB and an hourly chart for AAPL. This page could be filled with 333 tick charts of 10-year treasury futures, weekly charts of gold, and 8-hour charts of EUR/USD. They would show the same thing as the charts above: DynaRange doesn’t provide a prediction for every move, and not every move stops at a DynaRange level. But the number of times price does find a DynaRange line is pretty remarkable. You really should see it for yourself. Written by David Elliott, ‘Firstwave’ about 9 years ago. David Star has been able to take a concept i have been teaching, for over 12 years now, and put it to code that projects the price markets will move on spcific time frames. 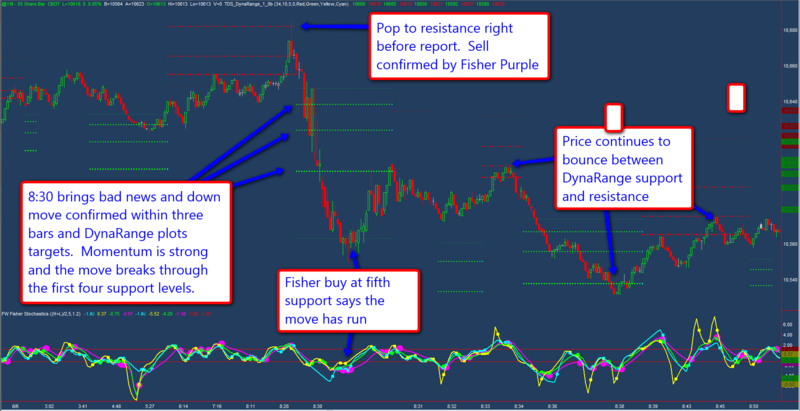 I found that using Dynarange with ‘FibGrid’ has enhanced my ability to make correct decisions on market support and resistance levels in the Intra-day Futures as well as for stocks both intra-day and daily. Written by J. W. Head about 9 years ago. Does DynaRange require adjustment for each stock or future in TOS, like Fibgrid? Written by Standard Deviant about 9 years ago. No adjustments are neccessary. 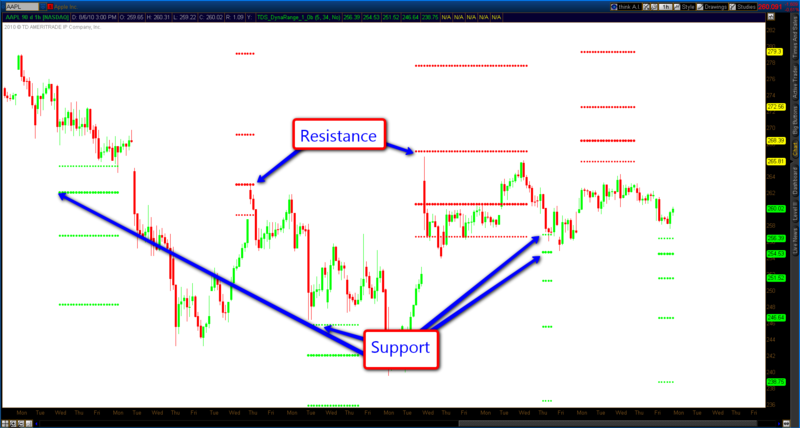 Put it on your charts and it works. DynaRange works by waiting for a move to start from a swing high or low and then looks for clues as to how far it might go. So it will work on any chart. Written by Pierre Arseneault about 9 years ago. Do your TOS studies work for CL futures? I trade mostly Crude Oil.